Father Francis fried five fresh fish for five French fathers from France. I remember walking on the streets of Cameroon, looking for some “roasted fish” to quench my raging taste buds after being away from home for a whole year. After eating the fish on that day, I felt very happy and at home. “Roasted fish” as it is called in Cameroon is fish, grilled on charcoal and popularly sold on the streets. Known in French as Poisson Braisé, this darling is widely loved in Cameroon. I started trying to make mine first by loading an old pot with charcoal, lighting it up, putting a grill on it and grilling. Then one evening I visited a friend and in a few minutes, just like magic, she had made some delicious grilled fish. I asked her how she did it and she said she “grilled” right on her gas cooker (stovetop). The thing is I could not even tell the difference between her fish and the “real deal” made on charcoal. This was totally cool so I started making my fish in a skillet or oven tray on the stovetop. Oh man, best decision of ma laif! The capital of the Littoral region in Cameroon, Douala is the hub of this dish. As the curious Precious that I am, I asked a Douala woman to teach me how they make their exotic pepper sauce to go with the fish. The first time I made the sauce with her prescribed ingredients, I felt like I was eating fish at the roadside. So authentic! By the way, “Curious Precious” will make a good cartoon title. Can I brag a little? 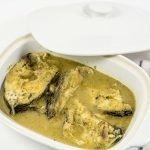 This recipe is the best and easiest Cameroonian Roasted Fish recipe you will find! Click the play button below to see how the magic happens. Here is the printable recipe for you! 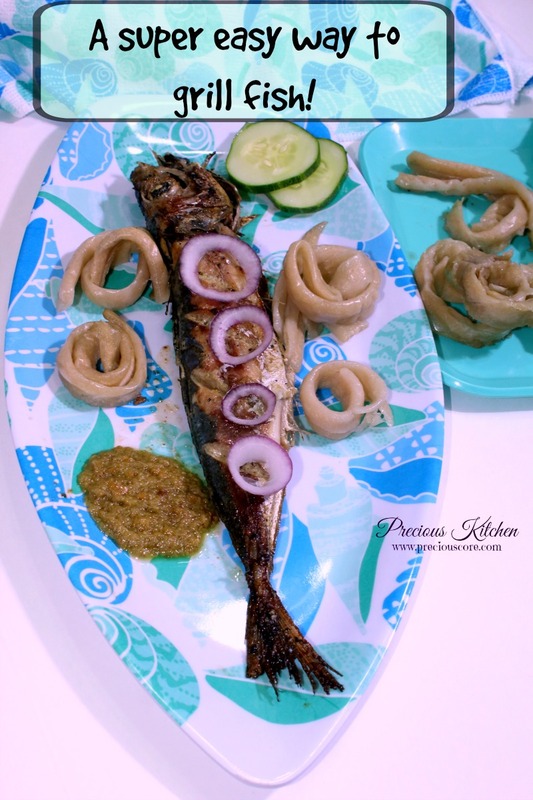 This is grilled fish done with Cameroonian flavours. So good! 1. Clean and gut fish. Rinse thoroughly with water then cut diagonal lines across each fish on each side. Sprinkle with about a quarter teaspoon of salt and rub well, making sure salt gets into the cuts. Set aside.2. Chop onions, peel garlic, ginger and pebe. Put all in a blender. Add in njangsa, white pepper, Maggi and a pinch of salt. Add in a quarter cup of water and blend into a paste.3. Pour half of the paste into a bowl to use as your marinade. Now add hot pepper to the spice paste and blend again.4. Pour the pepper and spice mixture into a small pot. Add a quarter cup of oil and bring to a boil. Let it boil for about 5 minutes.5.At this point, you could just marinate the fish and grill in an oven or follow this super easy method: Put a flat frying pan or an oven tray on medium heat (see video). Pour in a cup of water and about a quarter cup of oil to prevent fish from sticking.6. Rub marinade on fish and place on cooking tray. Let one side cook for about 5-10 minutes. Watch carefully to make sure water and oil are evenly distributed. If it dries up when fish is not properly cooked, add a little more. Flip and let the other side cook for about the same time.7. The fish is ready if it flakes easily when pricked with a fork. 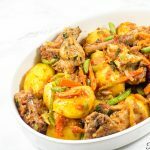 Serve warm with some of the made sauce on the side and some Niondo/Bobolo (fermented cassava (yuca) rolled in leaves and cooked) or some grilled plantains or fried Irish potatoes. Notes: If you wish to use an oven to grill, feel free to place the fish into the oven after rubbing marinade all over. 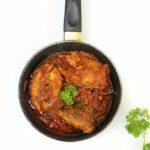 Check out my oven grilled fish recipe. What’s the one thing you like to eat with grilled fish? Fried/grilled plantains, French fries, Bobolo, Miondo or bread? That tongue twister! lol. Used to say it a lot as a kid. Nothing like grilled fish man. Love it! Lol, you know that tongue twister too? Grilled fish is my fave way to eat fish. Unbeatable! Awww I love you too, Bubu. 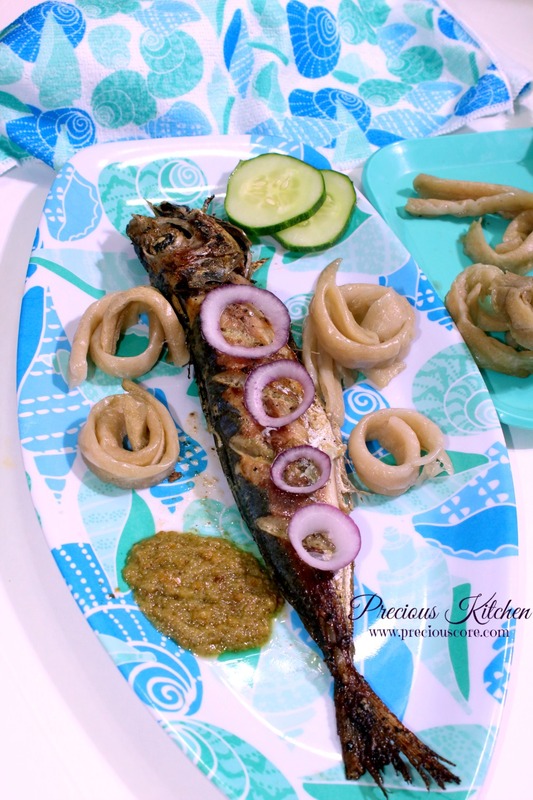 Is Bole grilled plantain? I love it! Thanks for coming back to let me know! Awesome recipe, I never knew this could be done on a stove-top, and I will have to try it very soon. I really enjoyed the video too, including the soundtrack from the girls and the smoke alarm. Thanks for welcoming us into your kitchen and showing us how you create memorable meals. I'm learning a lot! To know that you are learning a lot just warms my heart. Nice, keep up the good job. Do you know where I can get Njangsa in Lagos? Hi Madame, sorry I have no idea where you can get Njangsa in Lagos. You could equally make sauce for fish without it and it will taste great! I’m in Washington, DC, and I have the same question. I suppose I could try the international markets here. Is there a substitute that you can recommend, or do you think it’s better to do without if I can’t find it? Thank you for this recipe!! My husband is Cameroonian so I thought I should make an effort to try to make some Cameroonian food for him. He absolutely loved this dish and so did I! I felt like being in Cameroon for a moment. Do you have any plans for adding a recipe for bobolo? I would love to learn how to make them. Hi Jennie! Thanks so much for the feedback! So glad to hear of your success with the recipes. 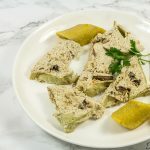 How sweet of you to learn how to make Cameroonian food! I will eventually add a recipe for bobolo. I’m working on that. My sauce keeps coming out of the blender bitter. Why? Linda, I have no idea why that’s happening. With my combination of spices, there should be no bitter taste in there. wow! thanks so much precious I was so enthralled with your recipe its indeed the best for roasted fish . I got it all right and perfect thank you. I’m so happy to hear that, Emmanuel! Thank you for the feedback!